FAQ and Articles - Matte and Glossy laptop screens. Which one to choose? HomeFAQ and Articles	Matte and Glossy laptop screens. Which one to choose? Screen - this is the main part of the laptop. This is something that visually conveys information to us, that we look at and work with. Glossy or matte - is a matter of taste, so it's your preference. 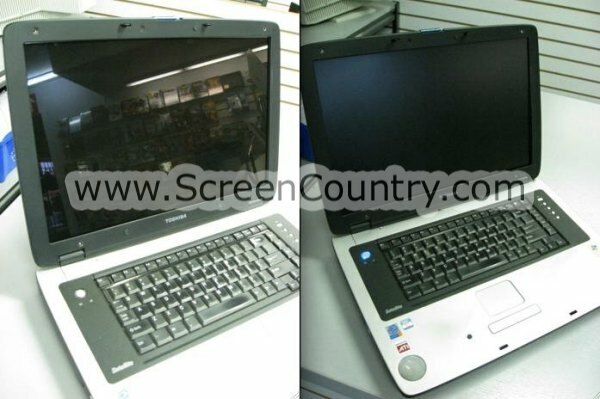 You can replace the matte screen to glossy, and vice-versa (on the same model of a laptop) as they are identical in their technical specifications, but are different in terms of functionality and image transmission. It all depends on what you're using your laptop for. All screens leave the conveyor as Glossy as a piece of glass (literally). In the final stages of production a clear sheet of polarizing plastic is overlaid, and the surface finish of the final product will depend on that particular plastic layer. Historically laptops came with Matte screen finish, and in the recent years, along with advents in backlighting technology, it became possible to release high Gloss panels, which will output enough light to cancel out external light reflecting from the screen. Nowadays only business oriented laptops will ship with Matte screens by default - it is assumed business laptops will be used in well-lit daytime environment, as opposed to consumer intended laptops which are assumed to be usually used in the evening and therefore ship with Glossy screens. Pros: contrast enhancement, noticeable sharpness and brightness of the color. Cons: If you use the screen in direct sunlight or near bright lamps, refelections will produce strong glare which will affect the visibility. Conclusion: Glossy screens are best suited for indoor use. Ideal for you if you use a laptop for viewing web sites, movies, photos and gaming in a dark or semi-dark, glare controlled environment. Pros: Does not reflect light, so there is no glare. This screen does not get dirty as quickly as glossy. Conveys a more diffused natural picture. Causes less eyestrain. Cons: Diffuses the sharp edges, evens out or normalizes the colors, lowers brightness and crispiness of the picture. If contrast and brightness are not as important to you, you want a more natural color, you do work with text or spreadsheets, you spend a lot time on your computer, a matte screen would be preferable. Matte screen is ideal for outdoor use or in the vicinity of bright light.